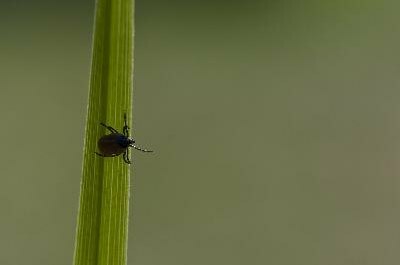 Ticks need 24 hours to transmit Lyme's disease. Deer ticks can easily hide in a cat's fur, making them hard to detect. Once you find them, however, you need to safely remove them immediately; this small insect can carry Lyme disease -- causing a rash, joint pain, and flu-like symptoms that require immediate medical attention for your pet. Pour a small amount of rubbing alcohol into the cup or bowl for disposal of the tick after you remove it. Pull on the rubber gloves to protect yourself from contact with the tick; you do not want your skin touching the insect. Part your cat's fur so that you have a clear visual of the tick, and locate its head. This is where it is attached to the cat. Place the tips of the tweezers around the tick's head and squeeze them firmly together without smashing the tick. Ticks can regurgitate bacteria into a victim if they are removed roughly. Grasp the tick's head and pull straight up, slowly but firmly. Be careful not to twist as you pull to avoid causing any further damage to your pet. Drop the tick into the cup with rubbing alcohol to kill it, and then dispose of the body by either flushing it down the toilet or throwing it in the garbage. Rub a cotton swab dipped in alcohol over the bite area on your cat to remove any bacteria. Cats are not always content to sit still while being groomed; if necessary, have a second person hold your pet while you remove the tick. After removing the tick, observe your cat for a few days for any potential signs of Lyme disease. Do not cover the tick in alcohol or petroleum jelly while it is still on the cat; you must remove it first.